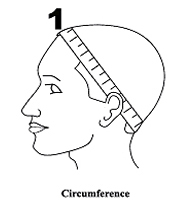 How to Measure Your Head for Custom Full Lace Wig? 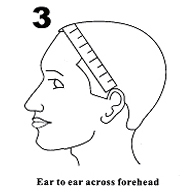 Measuring your head accurately is the most important task before ordering a Full Lace Wig or customing Full Lace Wig. Whether you are ordering a standard size or a custom fit Wig we recommend you measure your head at least 3 times to ensure a proper fit. Pin your hair as flat and tight as possible before taking the measurements to eliminate bulges that distort the head shape. 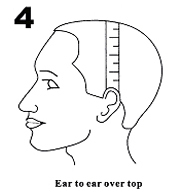 Remember to place your measuring tape a little outside of your natural hairline when taking the measurements. This will ensure that your hairline will be fully covered by your Full Lace Wig once glued to your scalp. For more accurate measures, consider having someone else measure your head rather than do it by yourself. Write down all your measurements in inches. From temple to temple across the back of head. (Average measurement is 14.5 inches). 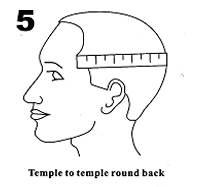 Note: Place the tape measure about 1/2 inch in front of your hairline at the temple to temple point on each side of your head. 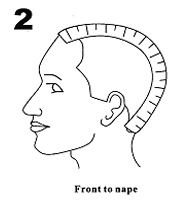 Keeping in mind that your cap is glued to the outside perimeter of your natural hairline in this area as well. 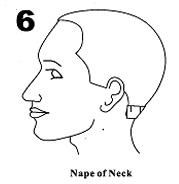 Measure the width of hairline across the nape of the neck. (Average measurement is 5 inches). IMPORTANT: Make sure that your measurements are ACCURATE. If you do not measure properly, your wig may not fit. Take your measurements at least 3 times to be sure.